Which is Harder: Physical or Digital Decluttering? If the chaos on your computer desktop sends you into panic mode whenever you open your laptop, it’s time to regain control of your digital space. Follow these everyday steps to eliminate digital clutter, organize your files, and restore calm to your screens. A recent SpareFoot survey found that millennials are more anxious about cleaning up their digital life than other groups. 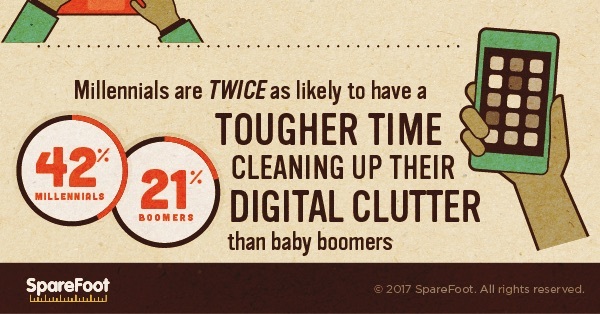 Millennials were twice as likely (42 percent) to have a tougher time tidying up their digital life than Baby Boomers. Perhaps that is because younger people have more digital clutter to contend with than older generations. However you may feel about cleaning up your computer and devices, you’ve read this far so you must be interested in going all the way with it. Luckily, we have broken down getting your digital life in order into 25 daily tasks that can be accomplished in a few hours each day. Jot down a few notes about what you hope to accomplish during this challenge. 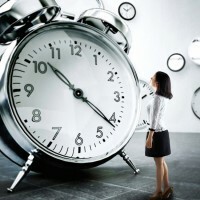 Stephanie Shalofsky, professional organizer and organizing consultant, recommends setting specific objectives for each project and blocking off a realistic amount of time to complete it. Creating goals and establishing a schedule will help you stay motivated throughout the 30 days. It’s much easier to make quick decisions about which documents and photos to delete if you know you have back-up copies of everything just in case. Manually back up your phone to the Cloud and your computer, then back up all your computer’s data to a physical hard drive. “It can be extremely overwhelming and difficult to quickly locate what’s needed when looking at a mass of file icons, poorly labeled files, and folders or read/unread messages all mixed together,” says Shalofsky. First, move any files you no longer need — like screenshots, duplicate photos, or digital sticky notes — into the trash. Next, create a new folder titled “Things to Sort,” and fill it with the remaining items on your desktop. You’ll organize these another day. Lastly, your icon dock is probably crowded with tools you never even use — delete these and keep only the icons you open every day. The downloads folder is the place where all your images, documents, memes, screenshots, and media files end up when you download them from the Internet or your email account. The number of items in this folder can accumulate fast and account for a lot of storage space, which is why it’s smart to move superfluous items into the trash. Drag any files you want to save into your “To Be Sorted” folder. Open every existing folder on your computer and sort through the items one by one to decide what to keep, Shalofsky suggests. Try filtering them by the date so you can easily see what’s no longer relevant, then drag anything you don’t need (or totally forgot you had) into the trash. Think: high school research papers, college syllabi, and PDFs of old flight tickets. If you can’t make up your mind, ask yourself if you’d be willing to hold onto a physical copy of the document. If not, it’s probably not important enough to keep. 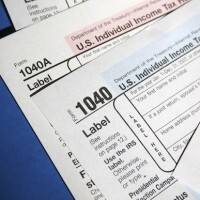 Start by creating folders for different categories, like “Personal,” “Work,” “Hobbies,” “Home,” and “Finances.” “[Be] sure to use names that resonate with you so you can quickly locate [and] file documents,” says Shalofsky. If you want to make sub-folders too, go for it. Once you drag all your files into their proper homes, go through each one (starting with the most relevant and recent) and rename it to include the date, type of document, and title. Creating a universal naming formula for your files will eliminate confusion and speed up the process of finding your stuff. 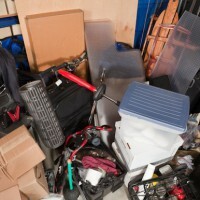 Certified Professional Organizer Ellen Delap recommends setting an alarm for tasks like these. That way you won’t succumb to nostalgia and waste hours scrolling through photos of your trip to Thailand in 2006. To start, sort your photos into albums based on the date or photo type. Label your albums accordingly and be as specific as possible (like “2017_October_John’s Birthday Party” or “2017_Website Logo_Blue”). After you organize your photos, open your albums one at a time and scan through all the images. Get rid of multiples, unimportant screenshots, blurry photos, or any pictures you don’t like. Though it may seem practical to use different email accounts for different purposes, spreading your messages over several inboxes can be confusing and overwhelming. It makes more sense to deactivate accounts you no longer use (like the hotmail email address you made in tenth grade), as well as accounts that don’t receive enough traffic to warrant their own inbox. From there, you can create a filter that automatically sends emails from different accounts to one primary inbox. It’s time to banish junk mail and restore peace to your inbox. Search your inbox for “promotions,” “updates,” or “sales,” open your emails one by one, scroll to the bottom of each, and click “unsubscribe” (or, in some cases, “update email preferences”). Keep in mind that you may have to press an additional button to complete the process. Before you delete an email, be sure to mark it as spam or junk mail so your computer learns to block it in the future. Leaving large email attachments — like contracts, images, and spreadsheets — in your inbox doesn’t just take up a lot of storage space, it also makes it difficult to find your files. Delap recommends sorting through your inbox and eliminating attachments. If you use Gmail, you can type “has:attachment” in the search box and add keywords to filter the results. From there, you can transfer any important attachments to a Word doc or spreadsheet, she says, and delete the rest. It’s good practice to look through your inbox and delete emails you don’t need, says Delap. Think: work threads that are no longer relevant, messages from people you don’t speak to, updates for events that have already happened, and so forth. If you have a massive inbox, try filtering your email by subject line, Delap suggests, then delete in large batches. Shalofsky recommends creating a simple inbox filing system by sorting emails into different folders or giving them specific labels. Leave any emails you still need to address in your inbox until you take care of them. This will significantly reduce the chaos in your inbox and make it easier to find and respond to messages. Get rid of any audio and video files that take up unnecessary space on your computer, tablet, or phone. Pick one category to start — like downloaded music or podcasts — and delete files you’ve either: 1) already listened to and don’t want to save or 2) don’t enjoy anymore. If the bookmark bar on your computer is cluttered with random web pages you “saved for later” — articles you meant to read or recipes you wanted to try — now is a good time to pare down. Removing the items you don’t click on regularly will leave you with easy access to your most frequently visited URLs. Make a list of all the websites where you have an online account — anything from clothing sites to non-profit organizations and unused social media platforms — then scan the list and put a star next to the accounts you use on a regular basis (like your bank, doctor’s office, or Internet company). Deactivate everything else. This may take some time, especially if you have different login information for each account, but reducing your online presence can help increase your financial safety and personal security. Make a spreadsheet with the following categories: website name, a link to the login page, your username or email, and your password. Fill in the spreadsheet with all your important account information, then get rid of any digital sticky notes or scraps of paper containing your passwords. Print out a copy of the spreadsheet to store somewhere safe or file the document in a password-encrypted folder (oh, the irony) on your computer desktop. Delap says it’s a good idea to create a spreadsheet with updated information for your contacts. Step one: open whatever contact list you currently have and delete names and numbers of people you no longer stay in touch with. Step two: transfer the remaining names and information to a master spreadsheet you can regularly edit. You can also use your email as a source of current contact information, says Delap. Each of your apps should bring value or joy to your life, so delete the ones you don’t use, downloaded and never opened, or gave up on because they didn’t work for you. This will clear storage space on your phone and reduce the visual clutter on your home screen. Organize your remaining apps into groups based on their function, like Social Media, Entertainment, Tools, or Travel Resources. Not only does this simple trick clear more space on your homescreen, it also forces you to be mindful of the apps you open since they’re no longer just one click away. Want to take it to another level? Put all your extra apps into a single folder and use the Search function to find and use them when you need to. Limiting the notifications you receive on your devices can reduce digital overwhelm, eliminate opportunities for distraction, and ramp up your productivity. Go to “Settings” on your phone, then scroll through your apps and turn off the notifications for any that don’t require your urgent attention (like Facebook or Flipboard). Your camera roll is probably clogged with screenshots, selfie retakes, photo bursts, and half-lit photos of restaurant food. While you may want to save some of these photos, storing thousands of images on your phone can eat up your storage space and significantly slow it down. Browse your camera roll today and delete anything you don’t want to save forever. Once you’ve purged some photos, organize the remaining images into albums with detailed labels. The best way to control what you see on your social media feeds is to cut out the junk. Pick a social media platform to start, scroll through the list of people you follow, then either unfollow or unfriend anyone who falls into one of these categories: people you don’t recognize or remember, people you don’t care to see updates from, people whose posts upset or anger you, or people who post so often that their content blocks your feed. You can also opt to “hide” certain posts on Facebook or “mute” people you follow on Twitter to streamline your feeds further. Open up the “Notes” app on your phone and delete any notes that aren’t useful or meaningful to you. If you have notes containing important addresses, ideas, or reminders, transfer them to a corresponding file on your computer where they’ll be safer. After decluttering, double-check your phone’s storage to see if you can free up additional space. Under Settings, go to General > Storage & iCloud Usage > Manage Storage to see which apps and services are using the most GB. From there, make some moves: delete old text message threads, get rid of playlists you don’t listen to, and trash duplicate photos on your editing apps. Now that you’ve decluttered and organized your digital world, the final step is to upload your data to the Cloud and back up your devices on a physical hard drive so everything is saved. 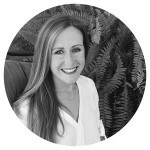 Paige Smith is a freelance writer from Orange County, California. She specializes in lifestyle, wellness, and travel topics. 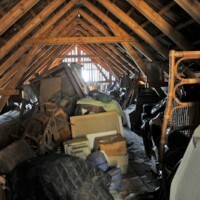 Is a Cluttered Garage Killing the Sale of Your Home?